Bringing a new cat or kitten into your family can be a very exciting moment. You can check out various breeds to learn what traits appeals to your lifestyle. One thing to consider is that most cats have a life expectancy of 15 to 20 years. 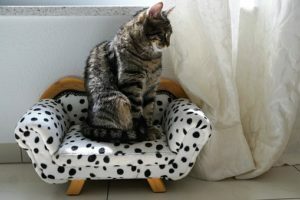 If you give a cat to your child, be sure you’ll be able to take responsibility for it if they return to college or if they move and are unable to take the cat together. Animal shelters are a good place to find a new family member and at times you can also find a pure bred pet. By adopting from an animal shelter, you are also saving a life as their time there is usually limited. When you are ready to embrace a new cat or kitten, the important things you’ll need to have are water and food bowls, a litter box, bed, grooming tools and plenty of toys for them to play with. Scratching posts and cat trees are a great way to train your new family member where they can use their natural instincts like climbing, scratching and jumping. It will also save your furniture. By being a responsible cat owner it is extremely important to have your cat micro-chipped and spayed or neutered. By doing this, it helps cut down on the amount of pets that wind up in the shelters. Most shelters and rescue groups include this in the price of adoption so it will be taken care of before you bring your new furry friend home. If you adopt a kitten it’s not difficult to train them to be indoor only. Elderly cats can also be trained, it is just a little harder sometimes. Cats can be sneaky so having a collar with a breakaway buckle and ID is always a good idea. Cats need to be exercised so having toys to keep them in shape. Having laser pointers and feather teasers you will have the ability to interact with your cat that will strengthen the bond between you. Cat proofing your home is extremely important to prevent any nasty accidents or worse outcomes. . Electric cords need to be kept out of their reach. All medications, chemicals and cleaning products will need to be stored in a cabinet they can’t open. Sometimes a child proof lock is necessary to assure their safety. Appliances such as dishwashers, washing machines and clothes dryers should be checked before you leave to make sure your cat has not climbed into it to curl up for a nap. Next Next post: A Dog’s Love is Like No Other!